Northwest of Fair Grove spanning the Pomme de Terre River lies BC Stables & Training Center, a magnet for trail riders and their equines. You’ll likely be welcomed by resident hound Jake, a passel of cats and a flock of chickens who scratch for morsels of grain in the sawdust of the indoor arena. 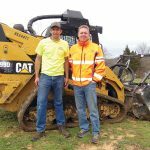 You’ll have your choice of about 20 miles of trails on some 500 acres, as well as a challenging obstacle course, two arenas and plenty of stalls and pastures to accommodate resident animals. Throughout the year, 60 to 100 equines may be pastured, stabled, in training or brought in for trail rides at any one time. Inside the barn and outdoor stalls, in the mare and gelding pastures and on the trails, you’ll find Thoroughbreds, Fox Trotters, Morgans, Arabians, Quarter Horses, mules, Mammoth donkeys, former jumpers, you name it. Some riders bring in their big travel rigs and camp for days. Others are day and weekend riders. 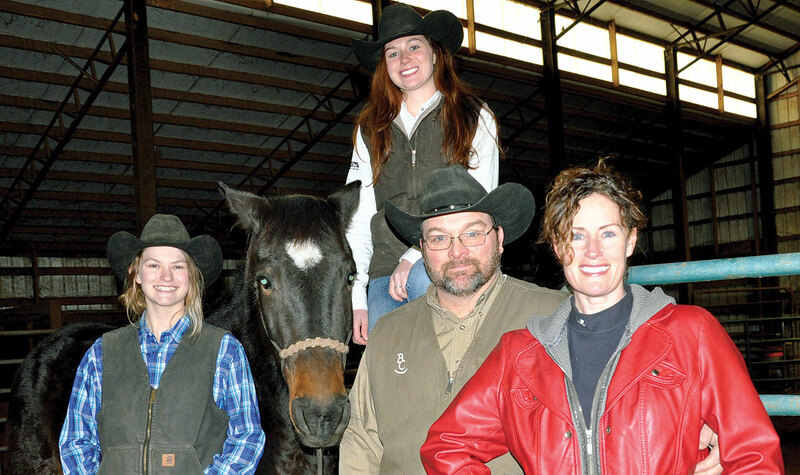 Horseman Tim Brock and his wife, Karen O’Very and her daughters, Lauren and Meghan, are the human faces of BC Stables. Their lifestyle is defined by their love of horses and desire to create a bond between animal and rider through the practice of natural horsemanship. It’s a relatively simple concept that’s complex to put together, Tim explained. Because horses and people don’t speak the same language, you begin by asking the horse to do something in a way it understands and can respond to correctly. Then you add another request and build on that. “The horse gains confidence and starts looking for ways to please you,” he said. “To build trust, you give the rider tools and ideas to help the horse understand what you want it to do. You end up with a mutual relationship that’s a 52/48 partnership. You have to help the horse do something correctly, to give it that win and then praise it and let it know it did it right. That’s a blast!” he said. Karen shared her own experience with natural horsemanship. “I didn’t know about the whole natural horsemanship thing until Tim. My horse was striking out at me and was aggressive, and I had this feeling that I had to be the dominant one, the one who called the shots. I went to Tim’s clinic with that mentality. I found out very quickly – in 10 or 15 minutes – I was wrong. I began sobbing when I realized that my horse was actually afraid of me and was not dominant aggressive. The minute my mindset changed, she began giving everything to me. Now, she would go through fire for me. We have a bond like no other,” she said. That, in fact, is what it did for Tim. His journey to BC Stables began in Indiana farm country where he didn’t have a horse until after college. “He wasn’t a good horse. I would ride him and come off him four or five times in a ride.” he admitted. People advised him to sell or get a different or bigger bit or “here’s what my grandpa would have done” advice. From there, Tim searched for better answers, including attending an equine show where John Lyons and Monty Roberts, two big names in natural horsemanship, were both present. “It opened my eyes to see them start a horse in just an hour. Why couldn’t I do that?” he recalled. He rented videos and bought books and began to understand it wasn’t about “breaking” a horse to ride. Then came an opportunity to take a Pat Parelli natural horsemanship class and to begin applying what he learned to his own wayward horse and others. Next, he spent a month at the Minnesota Horse Training Academy where he watched untouched, untrained horses change in a month to where they would do anything for their riders. He began training more horses himself and after a horse camping vacation at Brushy Creek Lodge & Resort in Missouri, he became the campground manager. Next door was a training center for show Fox Trotters. There, he observed and learned the difference between being a horseman and a trainer. “A horseman has the interest of the horse and rider and their relationship. A trainer has a timeline to get prepared for a show. I’m not knocking show trainers at all. 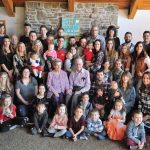 It’s just that they have a time schedule,” he said. Through fortuitous circumstances Tim learned of a former stable near Fair Grove. In 2010, he and Bob Cameron, the former wrangler at Brushy Creek – the B and the C of the new stable – began to build a business. Whether he’s teaching a class of 15 in the arena or solo on a trail with a horse in training, Tim just enjoys being on a horse. “I like to see that horse change as it figures something out. But I also like to watch the rider figure something out with the horse. That changes their dynamic forever,” he said. BC Stables has plenty of weekend riders, and Tim has no problem with that. “But to become a horseman, you have to be more engaged,” which takes time and practice. “There’s a statistic that of people who get into horses as adults, 90 percent will not own a horse in five years. I believe the reason is they don’t get the right help to get the right horse.